A fire was roaring in the fireplace; nearby, a large silver Skeith was sitting in an armchair, sipping a cup of hot tea. The door behind him creaked open and a green Grarrl lumbered into the room. His black top hat was dripping with rain water, and his heavy black boots were nearly soaked through. He set a lantern on the nearby side table and hung his coat up to dry. He then walked over to the Skeith. "Thank you, Mr. Sorbet," the Skeith said as the Grarrl handed him a stack of mail. "You can return to your duties," the Skeith added dismissing him with a wave of his hand. Mr. Sorbet bowed and left the room. The Skeith sat down his cup and began to sort through his mail. He stopped when he saw a letter from the Auction House. "This could be something interesting," he said as he picked up a silver letter opener. He slit the envelope and took out the paper. "Dear Baron von Bonbon," he read to himself, "we at the Auction House have come into possession of a very rare piece. It is an ancient tablet from a lost civilization on Mystery Island. This item will be up for auction tomorrow starting at noon." The Baron stopped and stroked his goatee in thought. "I can't let this pass me up," he said with delight. He was, after all, a collector of oddities such as this. In fact, his whole mansion was filled with precious artifacts and tomes. The Baron stood up and dusted some pastry crumbs off his jacket. "I can't wait until tomorrow!" The next day, the Baron and his butler, Mr. Sorbet, were on their way to the Auction House. Upon arriving the Baron was given a very warm welcome by the auctioneer. "Well, hello, Mr. Bonbon! I take it you got our letter?" the Scorchio asked as he shook the Baron's hand. "I'm telling you, this is a very fine piece! It will fit right in with your collection." "Yes, yes, I'm sure. Now if you'll excuse me I must get to the auction," the Baron said politely as he waved goodbye to the auctioneer. The Baron entered the Auction House and took his normal seat in the back. A few minutes later the whole house was full of well dressed, upper class Neopians trying to find their seats. After a while of shuffling and bumping around, everyone settled into their chairs. The lights dimmed and the auctioneer took his place at the podium. "Today's fine item is a real treat!" the Scorchio said as a worker brought out the piece in question. "This is an item from the Lost City of Geraptiku, never seen by the public until now! According to our highly educated historian, this tablet is a map to a lost treasure within the ruins of the city! We will start the bidding at 20,000 neopoints!" he said. "1,000,000!" shouted the Baron. Everyone stopped shouting and sat down. "Okay, 1,000,000 going once, twice sol..." The auctioneer was cut short. "2,000,000," said a voice. The Baron stood up to see who it was who dared to try to outbid him. He scanned the crowd trying to find the source of the voice. "2,000,000 neopoints!'" the voice repeated. Finally the Baron's gaze fell on the owner of the voice. He could only see the back of the man's head, but the Baron could recognize that ridiculous hair anywhere. It was his old rival Count Wolf! The nerve of that Lupe! Trying to take HIS tablet! "3,000,000!" the Baron roared. He knew that if the bid went higher than that, he had no hope of winning. After all, he never carried more than 3,000,000 neopoints at a time for fear of being robbed. "3,000,000 going once, twice and..." Once again the Lupe interrupted. "3,000,001," Count Wolf said flashing a knowing smirk at the Baron. "3,000,001 going once, twice, sold to number 42!" shouted the auctioneer, pointing at the Lupe. The Baron stood up, infuriated at the concept of losing to his life-long rival. He beckoned to Mr. Sorbet to follow as he stomped out of the building. Outside, the Baron sat down on a park bench. Mr. Sorbet stood nearby waiting for any orders from his master. “He made me look like a fool!” the Baron grumbled. He had never been outbid before in his life. “I never lose! Oh forget it,” he said glumly. He motion for his butler to come over. “Book me the next train back to the Haunted Woods,” he ordered. His butler bowed and went about his task. A few hours later the Baron and Mr. Sorbet were seated in the first class accommodations of the Neopian Express. The Baron was sitting in his seat drinking his tea when there was a knock on the door to their cabin. “Get that, Mr. Sorbet,” the Baron said, still angry about his earlier loss. The Grarrl stood up and slid the door open. “YOU!” the Baron screamed. Standing in the doorway was a ghost Lupe. He was dressed rather handsomely in a pricey looking jacket, with green colored slacks, and was wearing a pair of black dress shoes. The most noticeable thing, however, was the large hairdo protruding from the top of his head. “Yes it’s me. Now calm down, BB,” Count Wolf said, smiling at him. “I told you to never call me BB! Anyway, what do you want? Come to gloat about making me look like a fool. You know I have a reputation to uphold,” the Baron said, glaring at the Count. “Well, as you know, I have in my possession a rather rare artifact,” the Count said, seating himself next to Mr. Sorbet. “Okay, okay, fine! To make a long story short, after purchasing the relic, I’m a little low on funds. I was wondering if you could fund an expedition to Geraptiku. In return you would get half the treasure, and I would give you the tablet for your collection,” Count Wolf offered. “Thank you! I’ll see you in two days at the Mystery Island Harbor,” Count Wolf said, happily clapping his hands together. He bid them farewell and took his leave. “Why did I agree to this?” the Baron asked as he took a sip of his tea. Two days later, the Baron and Mr. Sorbet were standing on the docks of Mystery Island. The Baron was pacing back and forth, constantly checking his pocket watch. “Where is that stuck-up windbag now?” the Baron grumbled, checking his pocket watch yet again. “Over here, you two!” shouted a voice. The Baron turned around to find Count Wolf walking down the docks toward him. He was wearing khaki colored pants and jacket, along with a pair of hiking boots. “I have some for you also,” he said, digging into his backpack. “Let me just say that it is difficult finding anything in plus sizes,” he teased, handing the clothes to Mr. Sorbet. They walked over to a booth used for changing into bathing suits. “Sounds exciting!” Count Wolf said as he shouldered his backpack. The odd trio started to walk down the road to the main town. There they met their guide. He was a rather poor looking blue Kougra. After introductions were made, the group set off into the jungle. After nearly two days of hiking the group reached the outskirts of Geraptiku. “About time!” the Baron wheezed, wiping perspiration from his brow. He slumped on the ground and took a drink of his canteen. “What’s wrong, BB? Your butler is in better shape than you!” Count Wolf jeered as he paid their guide. The Kougra immediately ran off. “That explains why he follows you everywhere,” Count Wolf said as he scanned the surroundings with his binoculars. Mr. Sorbet helped the Baron to his feet and the group hiked on. Finally, they reached the entrance of the ruins. “Let’s make camp for today,” Count Wolf said, unpacking his tent. Mr. Sorbet took the Baron’s tent and went about setting it up. That night as the trio sat around their camp fire, the Baron finally got a good look at the tablet. It was a very old looking thing, with illegible writing on its surface. He turned it over in his hand and looked at the back. It was jagged, as though it had been part of something else at one point. “Wolf,” the Baron said nudging his companions with his elbow, “Have you seen this? What do you think it was a part of ?” the Baron asked as he showed the Count the back of the tablet. “Who knows? We’ll learn later,” Count Wolf said as he rolled over and went to sleep. The next day the trio awoke to the strange sounds of the jungle. “Let's get a move on!” Count Wolf said as he packed up his things. “What? No breakfast?” the Baron asked disappointedly. “No time! We have to figure how to get that door open,” Count Wolf said, pointing to the entrance of the ruins. He walked over and started to run his hand along the edge of the door. “Of course it’s no problem for me,” he said, smiling. “After all, I’m a ghost. However, you might have some problems,” the Count said as he faded through the door. “Trying to ditch us, is he?” the Baron asked himself. “Well, this door won’t pose any problem for me, and by that I mean you,” he said, pointing to Mr. Sorbet. The butler nodded and approached the door. He eyed the stone slab, contemplating the best way to grab it. Finally he decided on the bottom. He wedged his hands under the stone and began to lift. The door was much heavier than it looked. His arms bulged and his boots dug into the ground as he used every ounce of strength in his body to move the door. Suddenly, the door shot up, knocking the Grarrl off his feet. A smug looking Count Wolf walked out into the light. “I found a switch inside,” the Count said, grinning. Mr. Sorbet lifted himself off the ground and growled at him. Upon entering the deserted ruins, the trio found themselves in a long dark corridor. “I have a flashlight in my backpack,” Count Wolf said as he rummaged in his bag. Seconds later the corridor was lit up. The group walked on. Soon they came to another door. “Let Mr. Sorbet get this one,” the Baron said. “Hold on, there is a weird picture here,” Count Wolf said, examining the door. On the surface of the door was etched a crude drawing of a snake like creature wearing a feathered headdress. “What do you think it could mean?” the Baron asked. Mr. Sorbet shouldered his way past him and started to open the door. When it was open, the group found themselves in a large chamber. “Look, there’s the door,” Count Wolf said, pointing across the room. “Let’s hurry. I have a strange feeling about this room,” Baron von Bonbon said. As soon as the thought passed his mind, a loud hiss sounded from the ceiling of the chamber. He looked up and saw a large ghost Hissi glaring down at him. Just like in the picture, it was wearing a feathered headdress. “Everyone, duck!” the Baron shouted as the Hissi swooped down over them. It landed directly in their path. “We have to get through that door!” Count Wolf shouted. “Whatever material this room is made of, ghosts can’t pass through it!” he added. The Hissi stared at them, not moving an inch. “What? Why me?” the Count said nervously. “Because, you said yourself that I’m out of shape,” the Baron said, smirking at him. “Now get out there and do something. Mr. Sorbet and I will sneak around behind him and open the door,” he said as he shoved the Lupe forward. “What should I do?” he whispered as the Baron and Mr. Sorbet started to inch along the side wall. “I don’t know! Tap dance for him!” the Baron whispered back. “What do I look like, some cheap petpet? Fine, I guess it’s something.” He approached the Hissi. The giant serpent stared back, its eyes unblinking. In the awkward silence that followed, the Count started to tap dance. About half way through his act, the creature spoke. “What on Neopia are you doing?” it asked in a gravely voice. “YOU CAN SPEAK?” the Lupe said, his eyes wide in awe. “No, never! Why would I dessstroy my own home? I’m jussst sssick of living in thissss cave. I jussst wish to live sssomewhere with more sssspace!” it hissed, a teardrop of ectoplasm dripped down its cheek. “Okay, my gut says you're telling the truth,” the Count said mournfully. “BB, have Mr. Sorbet open the door,” the Lupe said. The group followed the Hissi out into the city and watched as it slunk out into the jungle. “The treasure chamber isss in the next room!” it called as it slid into the jungle. “Did you hear that! ?” Count Wolf shouted ecstatically. “The treasure chamber!” He turned back into the ruins and broke into a run. After arriving in the Hissi’s former home, he stopped and waited for the Baron and Mr. Sorbet to catch up. Finally, they entered the chamber. Once again the Baron was out of breath. 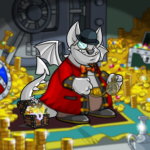 The Grarrl turned and look at his master waiting for his approval. The Baron nodded his head and he set about the laborious task of opening the door. After much struggling, he finally gave up. "Why won't it open?" the Count asked pacing up and down the corridor. The Baron walked over and looked at the door. "Wolf, give me that tablet," he said, reaching out his hand for the rock. "There is an indentation in the door that looks like the exact shape of the tablet." The Count reluctantly handed over the tablet. After repeatedly trying to fit it into place, the tablet clicked, and the door started to open. Once it was open, the Count charged into the treasure chamber.